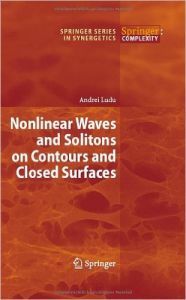 The present volume is an introduction to nonlinear waves and soliton theory in the special environment of compact spaces such as closed curves and surfaces and other domain contours. The first part of the book introduces the mathematical concept required for treating the manifolds considered. An introduction to the theory of motion of curves and surfaces is given. The second and third parts discuss the modeling of various physical solitons on compact systems. Nonlinear and solitary waves are historically related to quasi one-dimensional systems where the spatial extent in one direction is much bigger than in the other direction, such as channels and fibres. The present book treats the case of more compact systems and their nonlinear ascillations, which have only recently come into forms. Such systems include liquid drop models, Bose-Einstein condensates and even living cells. A general formalism is developed, based on the differential geometry of curved manifolds, and various applications are considered in the physical sciences and beyond.